The state has the third highest number (and the sixth highest percentage) of Native Americans of any state in the Union. 286,680 were estimated to live in Arizona, representing more than 10% of the country's total Native American population of 2,752,158. Only California and Oklahoma  have more Native Americans. The perimeters of Phoenix, Tucson, Prescott, Flagstaff and Yuma border on Native American reservations. The largest ancestry groups in Arizona are Mexican (25.8%), German (16.5%), English (10.3%), Irish (10.9%), and Native American (4.5%). The southern and central parts of the state are predominantly Mexican American, especially in Santa Cruz County and Yuma County near the Mexican border. The north-central and northwestern counties are largely inhabited by White Americans. The northeastern part of Arizona has many American Indians. Asian Americans also made major contributions to the development of Arizona, such as the many Chinese who arrived in the state's mines and railroads, and the fact that over 20,000 Japanese Americans, mostly residing in the Grand Avenue section of Phoenix and farming areas of southern Arizona and the Colorado River valley, were interned during World War II. As of the 2010 US Census, Arizonans who claim Filipino ancestry exceed 53,000. Filipino Americans are also the largest Asian American subgroup in the state. See also the list of native peoples. See also the list of Indigenous languages of Arizona. ^ "Table 1: Estimates of Population Change for the United States and States, and for Puerto Rico and State Rankings: July 1, 2005 to July 1, 2006". 2006 Population Estimates. U.S. Census Bureau, Population Division. December 22, 2006. Archived from the original on January 10, 2007. Retrieved December 22, 2006. ^ Bureau, US Census. "Population and Housing Unit Estimates". Census.gov. Retrieved 2 August 2017. ^ Chapman, Steve (April 23, 2010). "How immigration crackdowns backfire". Washington, DC: Washington Examiner. p. 31. ^ Slevin, Peter (April 30, 2010). "New Arizona law puts police in 'tenuous' spot". Washington, DC: Washington Post. pp. A4. ^ "Population and Population Centers by State - 2000". United States Census Bureau. Archived from the original on 2013-06-22. Retrieved 2008-12-04. ^ Bureau, U.S. Census. "American FactFinder - Community Facts". factfinder.census.gov. Retrieved 2 August 2017. ^ Bureau, U.S. Census. "American FactFinder - Results". factfinder.census.gov. Retrieved 2 August 2017. 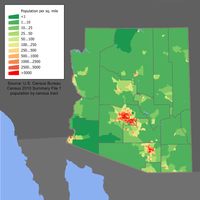 ^ "Arizona QuickFacts from the US Census Bureau". quickfacts.cenusus.gov. Retrieved 2 August 2017. ^ Bureau, U.S. Census. "American FactFinder - Results". factfinder2.census.gov. Retrieved 2 August 2017. ^ Nintzel, Jim. "Hispanics Leading Minority Growth in AZ". Tucsonweekly.com. Retrieved 2 August 2017. ^ "Births: Prelimanary Data for 2011" (PDF). National Vital Statistics Reports. U. S. Department of Health and Human Services. 61 (5). October 3, 2012. ^ "Births: Final Data for 2013" (PDF). Cdc.gov. Retrieved 2017-08-02. ^ "Births: Final Data for 2014" (PDF). Cdc.gov. Retrieved 2017-08-02. ^ "Births: Final Data for 2015" (PDF). Cdc.gov. Retrieved 2017-08-02. ^ Arizona has most Indian language speakers. Upi.com Accessed 2011-12-12.